It took us seven days to cross from the Lewis Pass to Arthurs Pass. An amazing route through the Hope Kiwi Valley over Harpers Pass and Goats Pass. 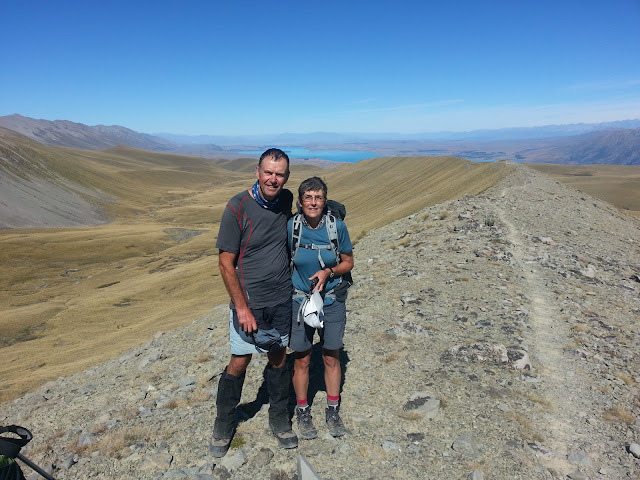 John and Helen, kiwi tramping with wet feet! We continued to walk in the heat wave setting off extra early from the huts to avoid the hottest part of the day. Our first stop was Hope Kiwi Lodge, a stunning hut in the most wonderful location. Then over the Kiwi saddle with glimpses of Lake Sumner. We had a cool off dip in the Hurunui river and stayed the night at the Hurunui hut. The next day was magic as we soaked in a natural hot pool on the side of the track, with no sandflies !!! Pictures not included. Then a short walk to the Hurunui 3 hut. This hut can be accessed by 4wd and a group of 3 hunters were there with enough food and booze for the week !! However they were back late and had a party whilst 7 trampers tried desperately to sleep. It is a difficult marriage of pursuits for hut use, trampers and hunters. Here we met a new bunch of Te Araroa trail walkers. Hi to Claire and Phil, Cisco and Road Runner and Roger a Nobo. That means Northbound walker, so we must be Sobos - Southbound, but we are not sure that we like that label. Over Harpers Pass which was a delightful track and then down to the Taramatau Valley and a night at the historic Locke Stream Hut. We stormed down the valley with dry feet till the final link track and ended up just wading up the river to the Morrison footbridge. Here we met up with good friends from the UK who were just passing and gave us a lift to Bealey Spur for a day off. 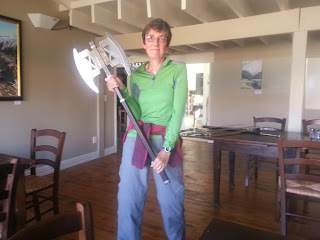 Hi Helen and John , hope you are having a great tour of NZ and great walks with dry feet. Thanks to Helen for her hospitality at the Bealey Eco Lodge. We then traversed the Deception Minga Valleys on the coast to Coast Race route, we were not racing !! It is a scramble rather than a walk and great fun in a heat wave as we had 18 river crossings. We left the track and caught the bus to Christchurch to resupply and say goodbye to our son Ben who has a 6 month job in Fiji. Thanks to Grant and Ann for all your help and donation and for getting us back on the track again. Over the Lagoon Saddle for the next section with great views back down to Arthurs Pass. We then dropped into the Harper river and onto the Hamilton Hut - an awesome hut with a huge stone fireplace. It was great to catch up with Cisco and Roadrunner again. We continued to Harper village and down to Lake Coleridge. Cisco introduced us to the term " trail angel", - anyone who helps you on the trail. The next day our Trail Angel arrived - Megan to drive us around the Rakia, walk with us for 3 days and get her Mum to meet us with cold beer and chips at the end. !! It was a great 3 days of walking , the first day was easy on a 4wd track and we could look at the views not our feet. A night at Comys hut then 2 tough days . Walking up the river with over 40 river crossings, up steep hills and through giant tussocks, spaniards and matagouri (both vicious spiky plants). Manuka hut was awesome and a great place to rest. We descended then towards Lake Clearwater and on to Mt Potts Station. 32 kms , our greatest distance in a day so far. How is the blister Megan ? The Rangitata River bed is 10km wide and took us almost 3 hours to cross but was only knee deep as it has been so dry.Once on the other side we went up Bush Creek to the Crooked Spur Hut in the Two Thumb range. Awesome country, and we are trying to love tussocks!! The weather continued to be hot and sunny as we made our way up to the Royal Hut. So named as Prince Charles and Princess Anne are supposed to have stayed there as children. Then over Stag saddle the highest point of the whole Te Araraoa - 1930m, we were blessed with blue skies and not a breath of wind. The ridge down from the saddle was just the best track with views of Lake Tekapo and Mt Cook. We stayed at the Camp Stream hut, built in 1898 and then down to Tekapo via a great track - the Richmond track , would be great on a bike too. We are now in Tekapo with our campervan and just moving on to Wanaka before getting the bus back again. What a journey, great company , great country and we have now raised $5,000 for Cancer Research. Two gnarly trampers on the Stag Saddle Ridge. If you would like to donate please click on the link............ Brodies Walk for Cancer Research. Hey there amazing adventurers - thanks for the latest update. Good to see some settled weather and smiles. Gnarly indeed. We've had a few adventures here in Chch too. William David arrived 1 Mar in an uncomplicated 2 hr labour (!). Joe loves Will or Willsy as he calls him and is doing ok with the changes, though it has been challenging for him. I'm surviving these early sleep deprived days and Andy is loving his new practice, so it all go around here. Safe travels for the rest of your journey and hope to see you both soon. Keep up the amazing work - outstanding effort on the fundraising too!! Love reading your posts!